Developed in China thousands of years ago, acupuncture is a treatment that involves placing tiny needles into a patient’s back, arms, neck, head, and other body parts. These needles are placed strategically, targeting specific points, and helping to release vital chemicals into the body. Acupuncture has a wide variety of benefits. Not only does it help to treat physical ailments, but psychological and emotional ones as well. Read on to find out what acupuncture can do for you! If you live with frequent headaches, you understand just how debilitating they can be. Severe headaches can take over a person’s life, keeping them from doing things they enjoy, and even preventing them from getting a good night’s sleep. Fortunately, acupuncture has proven to be effective in treating those with frequent headaches. As needles are placed in the upper back and neck, they stimulate pressure points that release vital body chemicals, resulting in pain relief. Studies have shown that regular acupuncture sessions can not only relieve the pain associated with headaches, but reduce the frequency of headaches as well. However, regular sessions are often needed to achieve this. Like frequent headaches, arthritis can be a debilitating condition that affects the overall quality of a person’s life. Those who suffer from arthritis are oftentimes consistently in pain, making it difficult for them to physically or mentally enjoy simple daily activities. Acupuncture has been used to ease the pain of many arthritis sufferers, stimulating specific points in the body and releasing important chemicals. If you decide to use acupuncture treatment to treat your arthritis, we highly recommend going to a licensed physician. Those who suffer from insomnia know how awful it can be. Insomnia sufferers often spend their lives in a state of near-perpetual exhaustion and irritability. Are you struggling with insomnia? Can’t find a treatment that offers meaningful results? If so, you may want to consider acupuncture. Acupuncture treatment will help release the chemical known as melatonin into your body. Melatonin is a natural sleep aid—one that eases the mind and allows the body at large to relax. Having this chemical released into your body on a regular basis vastly improves the quality of sleep for many people. Looking for a non-pharmaceutical way to treat your anxiety? Acupuncture might be just what you’re looking for. Just as the procedure helps to release melatonin into the body, it also helps to release serotonin. Serotonin is the body’s “feel-good” chemical. It eases the mind, slowing it down and improving its overall functionality. Anxiety isn’t the only psychological condition that can be treated with acupuncture. Depression can be treated with the procedure as well. The reason for this is the same as with anxiety: acupuncture helps the body create serotonin. If you’re trying to combat feelings of hopelessness, meaninglessness, and sadness, acupuncture could be the key. However, if you’re going to pursue acupuncture treatment, it’s wise to make sure you utilize the services of a trained osteopathic physician. Such physicians know how to get the most out of the treatment, and how to perform it safely. Are you interested in benefiting from acupuncture? 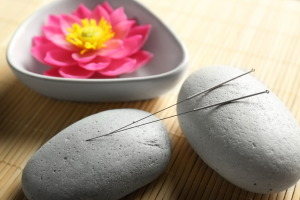 Looking to undergo acupuncture in Chicago, Illinois? If so, the Feely Center for Optimal Health has you covered. In practice since 1981, we have provided acupuncture treatment to a wide variety of patients. Our team of highly skilled and highly educated physicians is experienced in the carrying out of the procedure, providing positive results on a consistent basis. Contact us right now to schedule your first appointment!